Oak and Ash Classes went to the Heritage Centre in Dulverton as part of their topic on World War 2. Sue Cottrell from the Heritage Centre has organised local people to come and talk to the children about their wartime experiences. Oak Class listened to first-hand knowledge of what it was like to be evacuated at the age of 3 to a relative's farm near Dulverton and not return home until they were 9! 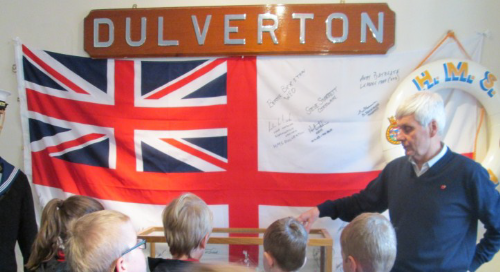 Both classes listened to a talk about the Royal Navy destroyer HMS Dulverton and its work in the war and looked at a model of the ship on display. The children also learned about rationing and how life on farms in the area was very different as food was more readily available. 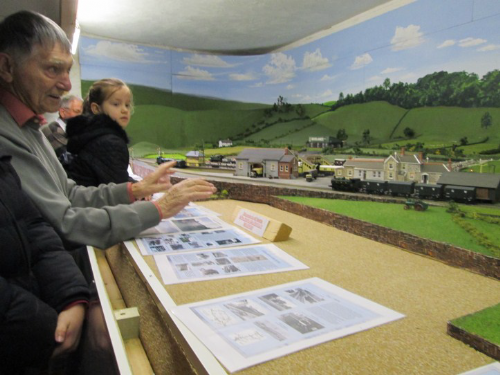 The model railway was also opened to the children and they were told about its importance to the war effort. Trains brought in American troops who were training on Exmoor, evacuees and pregnant women were brought to Exmoor House as it became a Maternity Hospital during the war. Did you know a 'rabbit train' left Dulverton station every day bound for London with over 2,000 rabbits on board? Julie Christian, Sue Cottrell and Tony Slowly worked very hard to organise this occasion for the children. We would like to send them, and all the volunteers who gave up their time to share their experiences with us, a HUGE thank you. It was a very interesting and informative afternoon. Miss Campbell.